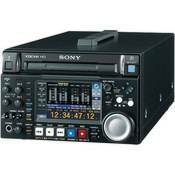 The PDW-HD1500 is a compact HD recorder which provides outstanding picture quality of MPEG HD422 as well as an eight-channel (HD-SDI), 24-bit audio recording capability. What’s unique about this deck is its ability to operate on AC, DC or power. With its large 4.3-inch* LCD and built-in speaker, it performs as a versatile and high-quality recorder which is suitable for both in-house and field operations. It comes equipped with a multi-format up/down converter, which is highly useful when employing both HD- and SD-format materials at the same time. *Measured diagonally.